Bert Murdock music has been supporting Utah's music programs since 1975! 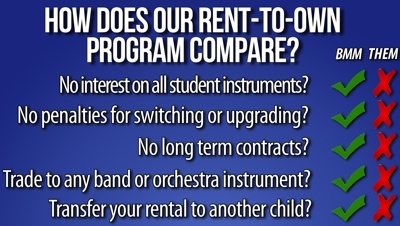 Our rent-to-own program is designed to allow parents the options and flexability of a low monthly payment while maintaining the ability to purchase or end your rental at any time. Affordable monthly payments - as low as $17 per month! Rent-to-own, until you own it or return it, it's up to you! Interest-free payment option on ALL instruments! No penalties for switching instruments or upgrading! Cases and pertinent accessories included! Repair & Replacement Plans available! Keep your instrument in top playing condition! Convenient Service! Rent online or visit us or our partners at 16 locations across the State! *Available for Utah residents only.